We focus nearly obsessively on the question of what to eat. … But an equally important question lies almost completely unanswered. What effect does meal timing have on obesity and other metabolic parameters? Quite a lot, it turns out. Having a well defined fasting period is likely very important. Time to first detection of human pathogens resistant to vaccines and antimicrobial drugs. Viral vaccines are labelled in purple, bacterial vaccines are labelled in green. Blue ‘x’s denote the first observations of resistance, with lines starting at product introduction (except for smallpox vaccination which began much earlier). Note that in all cases, substantial public health gains continued to accrue beyond the initial appearance of resistance. Why is drug resistance common and vaccine resistance rare? 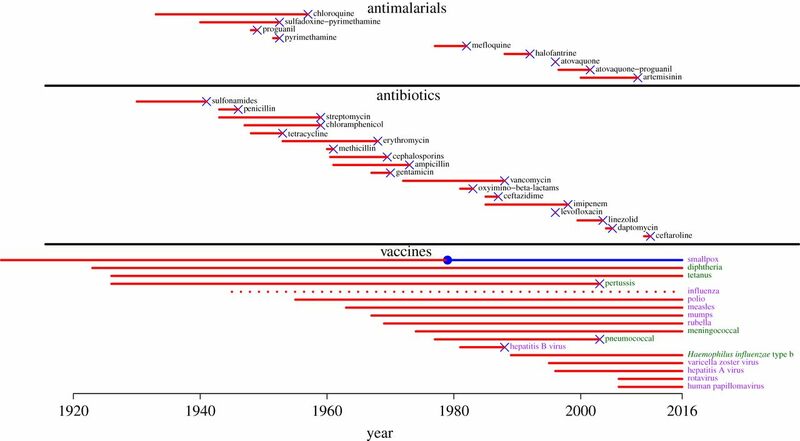 Drugs and vaccines both impose substantial pressure on pathogen populations to evolve resistance and indeed, drug resistance typically emerges soon after the introduction of a drug. But vaccine resistance has only rarely emerged. Using well-established principles of population genetics and evolutionary ecology, we argue that two key differences between vaccines and drugs explain why vaccines have so far proved more robust against evolution than drugs. First, vaccines tend to work prophylactically while drugs tend to work therapeutically. Second, vaccines tend to induce immune responses against multiple targets on a pathogen while drugs tend to target very few. Consequently, pathogen populations generate less variation for vaccine resistance than they do for drug resistance, and selection has fewer opportunities to act on that variation. When vaccine resistance has evolved, these generalities have been violated. With careful forethought, it may be possible to identify vaccines at risk of failure even before they are introduced. There is, in fact, no system. There are systems, but mostly they don’t talk to each other. I have to do that. Hospitals can still operate modern material technologies (like an MRI) just fine. It’s social technologies that have broken down and reverted to a medieval level. Systematic social relationships involve formally-defined roles and responsibilities. That is, “professionalism.” But across medical organizations, there are none. Who do you call at Anthem to find out if they’ll cover an out-of-state SNF stay? No one knows. A central research topic in ethnomethodology is the relationship between formal rationality (such as an insurance company’s 1600 pages of unworkable rules) and “mere reasonableness,” which is what people mostly use to get a job done. The disjunction between electronic patient records and calling around town to try to find out who wrote a biopsy report that arrived by fax seems sufficiently extreme that it may produce a qualitatively new way of being. In our fervor for high intensity exercise, we seem to forget about exercise’s older, more elemental sibling: movement. Source: The Big Vitamin D Mistake, Papadimitriou DT. J Prev Med Public Health. 2017. A statistical error in the estimation of the recommended dietary allowance (RDA) for vitamin D was recently discovered … The largest meta-analysis ever conducted of studies published between 1966 and 2013 showed that 25-hydroxyvitamin D levels <75 nmol/L may be too low for safety and associated with higher all-cause mortality, demolishing the previously presumed U-shape curve of mortality associated with vitamin D levels. Since all-disease mortality is reduced to 1.0 with serum vitamin D levels ≥100 nmol/L, we call public health authorities to consider designating as the RDA at least three-fourths of the levels proposed by the Endocrine Society Expert Committee as safe upper tolerable daily intake doses.